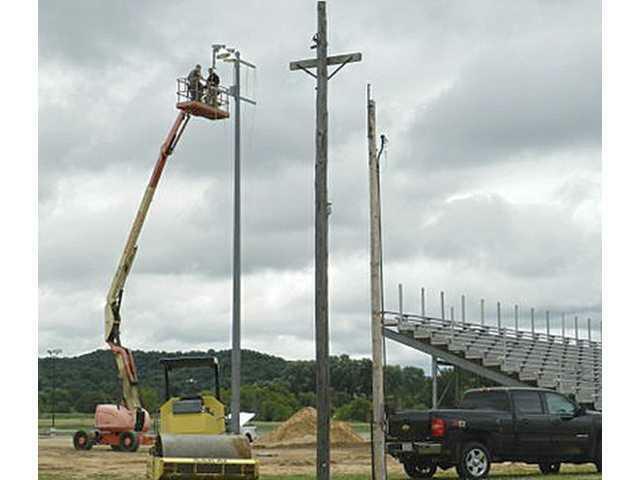 New lighting and a new grandstand have been installed at Firemen’s Park, on Hillsboro’s west side, in advance of the annual Charity Tractor Pull Aug. 8-9. POSTED August 7, 2014 8:44 a.m. However, loud or not, the highly popular event will roar into action Friday and Saturday evenings, Aug. 8-9, beginning at 6 p.m.
And, it’s really growing in popularity. All you need to verify that fact is to grab a look at the added grandstands that are able to seat an extra 3,200 fans. Hillsboro Equipment’s Don Slama, who heads up the Tractor Pull’s localized charity, seems to improve on both the event and Firemen’s Park every year. In addition to the much larger grandstand seating, the main roads in the park have been covered with asphalt and the parking area has been enlarged and improved. For more information, visit www.charitypull.com or phone 608-489-2275. Admission is $15 per person, per day. Kids, 10 and under, will be admitted free. So, when those powerful tractors begin to rev up, forget about the noise, and think about the loud jingle all those coins will make when they are counted up for the use of local charities. The Ebola Disease outbreak news from Africa is all bad, but for Hillsboro educators Greg and Kristi Zimmerman, it has a truly personal impact. The Liberian school and orphanage where they have visited is in the front lines of the battle and they have had to cancel plans for a return trip. The Zimmermans have received much support, financial and otherwise, for their project entitled “Hope’s Cause,” named after an orphan child from the area that was adopted by a friend. Greg and Kristi will continue to support the school-orphanage from this side of the globe and ask that your thoughts and prayers continue for the children and the brave, inspiring folks who are trying to hold things together during this terrible crisis. There are many people in Hillsboro with their hearts currently in Liberia and the other countries affected. We’ll try to keep the news lines open through Greg and Kristi, and ask that you do the same for your personal prayer lines.